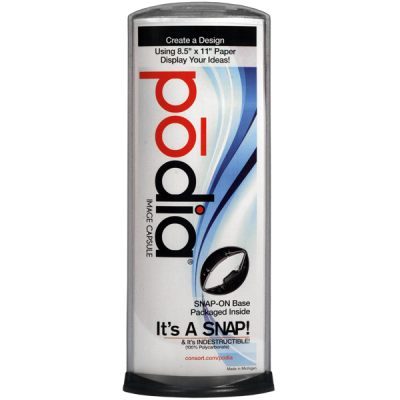 Try Podia for Free! Just pay shipping. Designed to withstand the rigors of restaurant use, Podia is manufactured from a durable polycarbonate. As a double-sided sign holder, it is perfect for displaying tabletop menus, specials and upcoming events. Podia is a simple, cost-effective solution that utilizes a single sheet of 8.5″ x 11″ paper, printed directly from your computer’s printer. Inserts can be swapped as often as needed to increase impulse sales. Additional base option styles are available to allow for additional placement opportunities. Because of this flexibility, Podia is a great solution for directional signage as well as tabletop promotions.